Ned Lightner at work on BCTV programming in the organization's downtown Belfast office and production studio. BELFAST, Maine — From an interview with the doomed captain of the HMS Bounty to thrilling play-by-play broadcasts of high school basketball, from midnight coverage of the storm surge of Hurricane Sandy to a ride in a snow plow, viewers of Belfast’s community access television station never know quite what they’ll see — and that’s a good thing. The cable channel is one of 80 public, educational or government channels in Maine, though only about 30 of those PEG stations are as active as BCTV, according to station manager Ned Lightner. It is the only station in the northeast region — New England states and New York — that won the excellence award in the category of stations with annual budgets of $100,000 or less. Efforts Tuesday to contact an official with the Alliance for Community Media were unsuccessful. The station is the only one from Maine to win an award in one of the 20 categories, though it was unclear Tuesday if any other Maine stations had entered the competition. Lightner, who works part-time at the station, said that in fact BCTV gets by on considerably less than $100,000 — its annual budget is just $13,000. With that sum, Lightner’s dedication, and the many volunteers who work to produce programming, the station creates all kinds of original shows. “The community should feel proud of this station,” he said Tuesday. Volunteer producers include the father-and-son duo of Robert and Brock Gordon, who have announced, taped and produced 20 high school basketball games. They include David Hurley of the slow-paced and bucolic “Tai Chi Through the Seasons,” and they include Mark Kuzio and Tim Woitowitz, who make a parody show called “ Chai Tea,” in which they do funny exercises in crowded local places. That’s just the tip of the iceberg, said Lightner, who often can be found editing late at night or on weekends. Tragedies across the globe are important, he said — but so is whether or not a person’s driveway was plowed after the last snowstorm. Lightner loved bringing his camera down to the harbor on New Year’s Eve, where the Belfast Drum and Rabble Corps rang in 2013 as the town bonfire was lit. Some people couldn’t attend, because they had children to watch or were simply unable to be outside in such cold weather — but by watching the event on public access television, they later told Lightner that they felt a part of all the fun. “That made me really feel good,” he said. While a lot of the programming does let Belfast’s quirky side shine, that’s not all regular viewers of BCTV see when they turn it on. 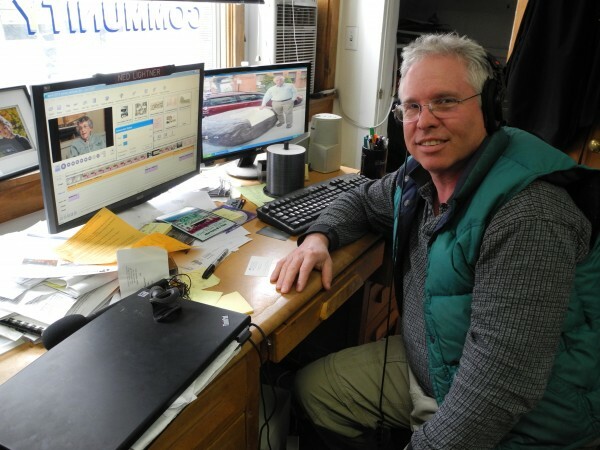 Lightner also makes shows about hot-button local issues such as the efforts in Belfast to withdraw from the RSU 20 school district or the controversy surrounding the proposed propane tank and terminal project in nearby Searsport. That has not gone unnoticed. Belfast City Manager Joe Slocum said that Lightner can’t be separated from the cable television channel.